American Social, overlooking the Miami River, invites guests to come enjoy an endless selection of local and regional craft beers, “pour-it-yourself” beer taps, traditional cocktails and all-American comfort foods. 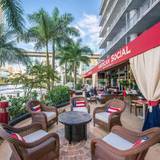 With over 9,000 square feet of space to eat, drink, and celebrate, American Social Brickell has quickly become Brickell's premier Happy Hour, Dining, and late night destination. Please fill in your information below and Adam Perhosky will contact you as soon as possible to book your event. If you’d prefer to talk now, please call us at (877) 346-0422.